BAEST,a.s. Benešov is a medium-sized enterprise of machine building industry of wide production programme. The firm‘s production facilities are located at a strategic location, close to E55 and E50 (D1) thoroughfares and has a railway siding of its own. By its activities BAEST,a.s., ties in to the operation of BEST, s.r.o., whose business and manufacturing activities it took over in 2002. 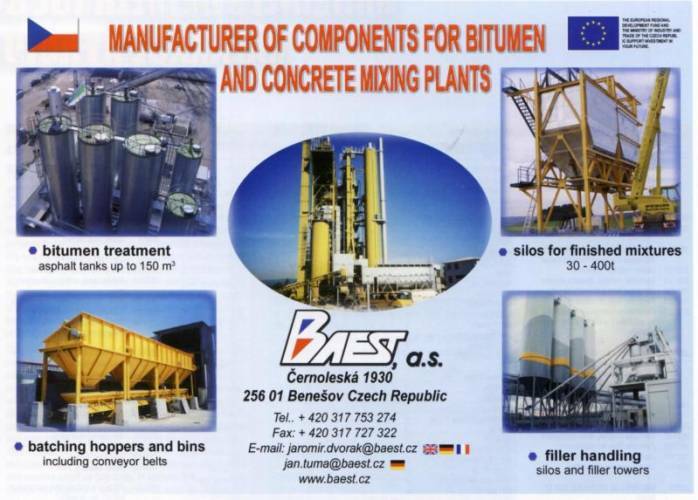 BAEST, a.s., is a private company with its manufacturing programme aimed at the production of welded steel structures and equipment for construction industry, machinery, energy industry, ecology and agriculture as well as chemical, petrochemical and food industries, employing about 240 people. The company operates production halls of the floorage of 30,000 m2 and storage areas as large as 10,000 m2 located in company‘s own premises covering the area of 17 ha. The production plants are well equipped with necessary lifting and handling technologies of the loading capacity up to 50 tons. Our production programme is focused not only on the repeated manufacture of standard products, but also on custom-built (small-series or even piece) production. Owing to our multipurpose technological machinery and equipment and highly competent teams of specialists it is possible to supply the wide and flexible range of products. Production documentation is prepared and implemented using modern CAD and CAD/CAM design and engineering methods (Autocad, Autodesk Inventor 3D, etc.). Already since 1998 the company holds the certificate of quality control management to EN ISO 9001:2000. In addition, the company holds t Special Welder‘s Certificate pursuant to DIN 18800-7:2002 Klasse E for the welding of crane steel structures and the AD 2000 HP0 certificate for pressure vessel welding. The quality production to relevant EN, DIN and ČSN standards has allowed the company to increase the share of exports in the returns growing every year. In recent years the proportion of exports on the overall returns has become stable at the level of 85 % being directed to 20 countries of the world. Our main customers comprise various firms of the EU, Eastern Europe and, last but not least, the USA. In 2000 the firm was placed third in the "DHL-the Czech Exporter of 1999" contest in the category of medium-sized enterprises, and won the first prize in the "Exporter of the Year" contests organised by the Czech Economical Chamber and the Industry Union under the auspices of the Czech Government in 2002 and 2005 in the same category. We believe you will become our satisfied customers, too. Workshop indoor (sq. m.) 30,000 m2 sq.m. Closed storage area (sq. m.) 10,000 m2 sq.m. Open storage area (sq. m.) 17 ha sq.m.